violating the law and the privacy of its customers by collaborating with the National Security Agency (NSA) in its massive, illegal program to wiretap and data-mine Americans' communications. That case was dismissed in June of 2009 after a federal judge ruled that AT&T and other telecommunications companies were free of liability under the FISA Amendments Act, signed by George W. Bush in September of 2008. In Jewel v. NSA, EFF is suing the NSA and other government agencies on behalf of AT&T customers to stop the illegal, unconstitutional, and ongoing dragnet surveillance of their communications and communications records. Not to worry, though. In a San Franciso courtroom last Wednesday, the Obama administration moved to dismiss the lawsuit using essentially the same arguments marshalled by the Bush administration. They even kicked the defense up a notch with a claim of "sovereign immunity." Judge Vaughn Walker will rule on the case in coming months. But for now, telcos can rest easy knowing that - at least when it comes to surveillance - the new boss is the same as the old boss. One of the biggest stories in the Attorney General's race is Ken Cuccinelli's call for a special session to deal with the Melendez-Diaz v. Massacheusetts decision. While Shannon thought Cuccinelli was going to far, and wanted Kaine to find an administrative solution, it now appears that Tim Kaine agrees with Ken Cuccinelli. RICHMOND, Va. - A Virginia lawmaker says Virginia Gov. Tim Kaine will call a special session to deal with a U.S. Supreme Court ruling that's having repercussions in the state's courts. The legislator spoke on the condition of anonymity Tuesday night because he was not authorized to pre-empt the governor's announcement. Kaine has scheduled a news conference for Wednesday, but his office says only that he will make two public safety announcements. A second legislator, House Democratic Leader Ward Armstrong of Henry County, said Kaine has told him he's leaning toward calling a special session. Cuccinelli was the person who realized how important this issue. He accurately predicted DUI cases would be dismissed, and made the difficult but correct decision. Once again he has stood up for what is best for Virginians, even if it may be politically difficult. Kaine's decision to side with a candidate from the opposite party over his own candidate for Attorney General means that he realized administrative solutions were impossible, and the special session is what is necessary to fix this problem. His actions will validate Cuccinelli's foresight, and accurate understanding of the law. The question is where we want to guide residential growth. Wherever we place roads on the CTP that don’t exist is where the County is inviting residential rezoning applications to occur since we know the state will not fund them and developers will not proffer them unless they get suburban densities -which is not in compliance with our comp plan. Proposing expensive primary and secondary roads in areas that don’t warrant them doesn’t make sense to me. If a developer wants to come in and propose a Countryside Village why don’t we allow them to propose the road connection that would make sense for that sort of development. That sort of development probably would not require a street grid. Right now the by-right subdivisions in the Lenah area connect off Braddock and Lenah Road. “What do you think of York’s proposal to take zoning ordinance review away from the Planning Commission?” Silly and misguided. Guess he didn’t take the PC training when he was a Commissioner. Don’t you think it is silly and misguided to attack the Chairman of the Board of Supervisors for deciding to remove zoning ordinance review away from the Planning Commission? After all, there is a Zoning Department, which reviews all land use applications before they go to the Commission, and there is a provision for a Zoning Ordinance Review Committee. Why have another zoning commission? Scott York has been involved in Loudoun government for a long time, so why attack someone who knows the issues facing transportation, etc. It seems to me that the Dulles Planning Commissioner would rather throw tantrums than work on the Countywide Transportation Plan (CTP), which will provide more roads and improvements. Today in a press conference Sheila Crump Johnson a self described lifelong democrat endorsed Bob McDonnell. Sheila Johnson lives in Middleburg, VA is "Co-Founder of Black Entertainment Television, a local business owner, and noted philanthropist and entrepeneur." She is also the world's first female African-American billionaire. One of the causes she has donated heavily to is the Democrat Party. According to VPAP, since 2003 she has donated $654,378 to Democrat candidates. This includes about $600,000 to Tim Kaine and his PAC, and another $1,000 each to Terry McAuliffe and Brian Moran. Her one donation to a Republican so far seems to be part of her effort to defeat Jill Vogel's campaign for State Senate. In the endorsement, Sheila made it clear that she believed that Bob McDonnell will help bring about the economic recovery this state desperately needs. This will help McDonnell among two of his weakest demographics, African-American and NOVA voters. While Sheila courageously took a stand for the good of the commonwealth, it will be interesting to watch Democrat bloggers turn on her. In other news, Creigh Deeds talks about horse manure in his stocking when asked about creating jobs in south west Virginia. Over the weekend Planned Parenthood endorsed Creigh Deeds. In the endorsement they talked about Creigh Deeds "consistent voting record in favor of protecting reproductive choice, access to emergency contraception and women's health." So much for Creigh Deeds being a moderate. You can't earn a ringing endorsement from Planned Parenthood and consider yourself a moderate. Bob McDonnell needs to remind voters in southwest Virginia of his support for life, and draw a distinct line between himself and his opponent on this critical issue. While the Obama administration is discussing the need for a second stimulus package, let's take some time to reflect on the success of the first one. The best person to tell us how successful President Obama's first stimulus package was is, Barack Obama. It is clear from listening to the president that the first stimulus failed. If the first one failed why do we need another one? Democrats, and the Obama Administration have a tendency to blame America for things whenever they go overseas. In a recent trip to India Hillary Clinton continued this trend by saying that America makes mistakes, one of which is being a significant contributor to the problem of global warming. Sadly the days of believing in American exceptionalism, and leading the world have left this nation under the Obama Administration. Probably the most shocking piece of new over the weekend was Chris Saxman's decision to withdraw from the race in the 20th district for the House of Delegates. Members of the 20th legislative district committee met yesterday to pick Chris Saxman's replacement. While many people expected them to pick a replacement at the meeting, they instead chose to wait and listen to the voters. Thank you for choosing to involve the local activists on this crucial issue. It will be interesting to see who ends up getting selected. Over the weekend Joe Biden highlighted a fundraiser for Creigh Deeds. Before the event in a statement published on his website, Deeds said, "I'm glad he's coming back to Virginia tonight as Vice President and am so honored to have his support." Creigh Deeds has chosen to associate himself with Joe Biden and his policies, and has even made money off of that association. It is only fair to ask what it is Joe Biden believes. Just like President Obama, Joe Biden believes there shouldn't be any coal plants in America. As a rural state senator, do you support eliminating coal plants from America, and watching those jobs dissapear from south west Virginia? Not only does Biden (and presumably Creigh Deeds) believe we should eliminate the coal industry, but Biden also believes we should, "spend money to keep from going bankrupt." While some mocked trickle down economics, this idea is absurd. Every business and family knows that you don't increas spending to keep from going bankrupt. If after the 2009 elections Virginia is in as bad economic straits as California, is this the path Deeds will use to keep Virginia from going bankrupt? Not only does Joe Biden believe increased spending keeps people from going bankrupt, he also admits to misreading the economy. We don't have to ask if Deeds will follow in Biden's foot steps on this front, because we know the answer to this one. Just like Barack Obama's running mate, Creigh Deeds' running mate (Jody Wagner) has misread the economy. While Creigh Deeds may be honored to have Joe Biden's support, it is actually quite scary to imagine Joe Biden's beliefs being implemented in this commonwealth. It would destroy this economy. In Joe Biden's stirring endorsement of Creigh Deeds, he asked all the donors to, "Break your neck for this man." While I wouldn't normally consider breaking my neck for a candidate, it may be all their is left to break in this state after Joe Biden and Creigh Deeds have their way with commonwealth's economy. The FOIAs concerning the scandal at the Loudon Planning Commission have been responded to, and now people are sifting through the e-mails and other documents trying to figure out what is going on. Over at Crystal Clear Conservative, their is a report on some of the findings. Remember, Sandra Chaloux, the commissioner at the heart of this, is the protege of Stevens Miller, the Democrat running against Tom Rust for delegate. Do Democrats really believe in getting paid for doing nothing, and keeping others from accomplishing things? Last week, I mentioned about the Planning Commission manifesto that is taking place in Loudoun County. Well, I have decided to follow up with that post, and yes, there is more to this than what meets the eye. Today, I would like to focus on an e-mail that was sent on June 25, 2009 from Sandra Chaloux, Dulles Planning Commissioner to the Catoctin Planning Commissioner that indicates her absence from a board meeting. I don’t think I am going to go to the PC CTP work session tonight. No quorum tonight probably means no CTP PC public hearing in July. Now, why would Ms. Chaloux decide to abruptly announce her absence? Could it be that she was angered by the previous Planning Commission meeting, where a previous motion that she had made to delay the July hearing was denied? Whatever the reasoning behind Ms. Chaloux’s abrupt absence, there is indication that this particular hearing had no quorum due to an e-mail that was sent to several Planning Commission members urging them not to show up for a hearing that was to begin adopting a draft recommendation. According to Leesburg Today, the Planning Commission was scheduled to meet three times a week, along with Saturday mornings to review the Countywide Transportation Plan. The Board of Supervisors set a deadline to have the Planning Commission’s revised plan by September. In the meantime, I guess we will see what happens on July 21, when the Board of Supervisors takes up the scheduling issues. However, I am still asking, is it ethical or right for a county employee to be absent from their appointed duties and still receive compensation? Barack Obama recently picked John Holdren as the science and techology czar. This person fits the bill for an Obama administration official, he is radical. John Holdren authored a book in 1977 entitled ecoscience which calls for "extreme totalitarian measures to control the population." This is another indicator of the true radical nature of the Obama administration. For some levity with the whole czar situation, here is a clip of Mike Huckabee. Sotomayor: Precedent or the U.S. Constitution? One of the things that stood out in today's round of Supreme Court confirmation hearings was the absence of the U.S. Constitution. I watched most of the questioning, and for someone who takes an oath to uphold the constitution she hardly mentioned it. She seemed to analyze court precedent when answering questions instead of explaining what the constitution had to say about the issues. She was even asked what criterion she would use to interpret cases dealing with the 2nd ammendment and property rights, and refused to explain that. It is shocking that she is unwilling to explain how she interprets the document she is supposed to uphold. Also if you would like to get some analysis of the first day of the confirmation hearings go here. In a recent NBC 12 interview Ken Cuccinelli answered the charge that he is some radical right-winger. This is something he is regularly being accused of. As soon as Ken joined the ticket after the convention the ticket was called the "most divisive ticket" by the Democrat Party. While he was unafraid to identify himself as a social conservative, Ken reminded viewers that he is the leader in the senate on both mental health issues, and property rights issues. His ability to reach out and work with people is the reason he is able to serve as a state senator from Fairfax County. If he really were a radical wingnut it would be tough for him to win in Fairfax. Instead he has a "complete record" and seeks to find areas of agreement with all voters. In the middle of the video (about 1:30) Ken makes the comment "If we can confuse them, we're happy to do that." Lowell Feld of Blue Virginia is trying to use this line as a "gotcha moment" with Ken. One other blogger even referring to this as a possible "macaca moment." They are trying to use this to say, "Ha, Ken is out pulling the wool over our eyes." However while you can pull a sentence out of context with any politician, this is not what Ken is saying. In the preceding sentence, Ken says, "There are a lot of issues I have been working on that just don't fall into their carricature of me." It is in this context that Ken makes the "controversial" statement. It is a matter of confusing people into thinking Ken is a radical right-winger. He is fine with letting people mischaracterize him. If they want to attack a straw man of him he is happy to let them remain confuses. He has a record to point to that is one of getting things done on issues important to all Virginians, and it is this record of getting things done that will lead him to victory in the fall. As the debate over healthcare heats up in the House of Representatives here are what a couple of our Republican representatives have had to say about it recently. Congressman Rob Wittman (R-VA 1) urges that all sides be heard in this debate. So far the Democrats have regularly kept Republicans out of the formulation of key legislation. Something this important needs to have all voices included. Representative Paul Broun (R-GA 10) made the point that the public option will kill people. While many are blasting this as a radical statement, sadly it is true. When government decides who gets certain procedures and who doesn't, they are in effect handing death sentences to certain people. When the government is running healthcare why should they make sure that the old or mentally retarded get the procedures? They are just a drag on society, aren't they? If you oppose government run health care, please let your representative know immediately. One of the candidates for the Republican nomination for congress in the 2nd district is Ben Loyola. While he does not yet have a website, he has a facebook group which lays out his personal stiry and why he is running. While I am not making an endorsement in this race yet, I think Ben Loyola's story as a man who escaped Communist Cuba and started a prosperous company is quite an inspiring story. We need to find more conservatives with these kind of personal stories to run for public office. A 25-year resident of Virginia Beach, Navy veteran, successful businessman, Conservative Republican, and Patriot, Ben Loyola is a living reminder of the American Dream. An officer in the Cuban navy before Fidel Castro seized power, Ben’s father, Ben Loyola Sr., saw the Communist takeover’s true intentions and mutinied against it. For his efforts, he was sentenced to death but managed to escape to that “shining city on a hill”, the United States of America. Soon after, two-year old Ben Loyola Jr. and his mother fled the Communist dictatorship and joined his father in the United States; bringing with them nothing but a single piece of luggage and the hope that America would lead to a better life. Ben’s humble beginnings provided him with the drive and work ethic needed to become the self-made man he is today. Ben’s parents instilled within him an intense love of country. Always grateful for the opportunities America had afforded him, Ben decided to serve his country in the Navy, attending the Naval Academy and eventually achieving the rank of Captain. In 1991, Ben founded Loyola Enterprises, an engineering service contracting firm, starting operations out of a spare room in his house. Today, Loyola Enterprises has 50 employees working in offices in Virginia Beach, Hampton, and Richmond. Ben is very active in the local community, having volunteered for the Special Olympics Committee, tutoring students for the Virginia Beach Public Schools in math and science, as well as volunteering and financially supporting the following organizations: the Plaza Volunteer Rescue Squad, Boy Scouts of America, Make A Wish Foundation, the Virginia Symphony, Virginia Ballet, and the Fraternal Order of Police. Placing the original intent of the Constitution in highest regard, Ben is a Pro-Life, Pro-Family, Pro-2nd Amendment, Fiscal Conservative. He’s a member of the Republican Professionals Network of Hampton Roads and is a life member of the National Rifle Association. He serves as a Vice-Chair of the Republican Party of Virginia Beach and has worked the polls for various Republican candidates over the years. Ben is married to Gretchen Loyola. Gretchen is an accomplished musician who played violin in the Virginia Symphony and is currently a Physician’s Assistant with Cardiovascular Specialists at Maryview Hospital in Portsmouth, Virginia. For Ben and Gretchen, Saturday nights are “God and Country” nights. They attend service at the Holy Spirit Catholic Church in Virginia Beach and afterward go shooting at the local gun range. It appears that one of the members of the Loudoun Planning Commission is trying to encouraging members to skip meetings inorder to delay votes on various proposals. What makes it more interesting is that the member in question, Sandra Chaloux, is considered the heir apparent to Stevens Miller the person running for delegate against Tom Rust. No matter what side of the pro-growth/anti-growth debate you are on encouraging people to skip meetings is inexcusable. These commissioners are paid county money to sit on the commission. For them to skip meetings and encourage others to skip meetings for political gain displays contempt for the people and the business the task they have at hand. For more details, Crystal Clear Conservative and Hooda Thunk are doing an excellent job covering this story. Does Creigh Deeds Care if his Constituents Lose Their Jobs? "One of the MeadWestvaco plants in his own Senate district stands to be directly affected by this bill. Many of the workers at the plant may lose their jobs because of the increased costs that will be imposed on the plant if the bill is passed in the Senate." Assuming this statement is correct (we already know this bill will hit rural areas hardest) Deeds silence begs the question, does he care if his constituents lose their jobs? If he really cared about his constituents wouldn't he fight tooth and nail against this bill? Deeds refusal to oppose cap and trade tells Virginians he prefers partisan politics and standing with the national Democratic party over fighting for Virginians best interests. The Warner/Kaine administration was marked by partisanship. This is the tradition Creigh Deeds has pledged to follow, and sadly he is taking it to a new low by allowing Virginia to lose jobs in his support for partisan politics. On July 4th one of Ken's many stops was the Roanoke Tea Party. Ken compared the current situation to the first tea party where the Boston Tea Company was bailed out and then the colonists were taxed. He reminded everyone that it was the Republicans who started the bailouts, and told everyone that as Attorney General he intends to draw a line in the sand with the federal government and protect out state rights. Ken is a true unabashed conservative, let's work hard to get him elected this year so he can fight for us for the next four years. Today the first poll of all three statewide races was released by Public Policy Polling. On the CRFV Blog I posted about the good news this is for the whole Republican ticket. I would take a moment to analyze what this poll means for Ken Cuccinelli. The poll reports that Ken Cuccinelli leads Steve Shannon 45%-38% overall and 44%-26% among independents. (Ken also enjoys the support of 85% of Republican voters compared to Shannon who only has 80% from his own party.) While this is great news (especially since Shannon is well funded and had no primary contest) when you analyze the undecideds the poll gets even better. Independents have the largest percentage of undecided voters with 30%. Since Ken seems to do well among these voters there is more room for his lead to grow their. Interestingly 14% of Democrats are undecided. If they are undecided this far into the campaign season their has to be a possibility Ken can pick up some of these votes as well. The person who some people say is too radical to win in Virginia is leading in the first poll, and even leading among independents. Let's continue to work hard and make sure Ken and the rest of the ticket win this fall. In a poll released yesterday Gallup found that almost 40% of Americans have become more conservative. Out of all Americans 39% consider themselves more conservative while only 18% consider themselves more liberal. 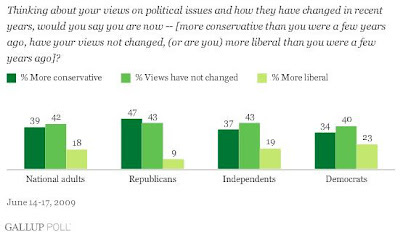 47% of conservatives consider themselves more conservative, as well as 37% of independents and 34% of liberals. This does seem like the year to be running as a conservative. Bob McDonnell sent a message to his supporters remnding them of the importance of Independence Day tonight. If you don't have 4th of July plans made yet come on up to the Conservative Soiree hosted by Leadership Institute. There will be conservative speakers (including Adnan Barqawi), food, and fun for the family. If you can't make it or already have plans, please take the time during the festivities of the day to read the Declaration of Independence and consider the principles this nation was founded, and what has gone into preserving our freedoms. McDonnell: "This series of ten gubernatorial debates statewide from July through October will reinvigorate political discourse in Virginia, and ensure that this race is marked by a serious discussion of the major issues facing the Commonwealth." RICHMOND- Bob McDonnell, Republican gubernatorial nominee and former Attorney General of Virginia, today proposed a formal series of ten gubernatorial debates, taking place statewide, between himself and Democratic nominee Creigh Deeds. McDonnell proposes that the debates begin with the already agreed to Virginia Bar Association debate taking place in Deeds’ home county on July 25th, and conclude with a final debate at the Rotunda on the grounds of Thomas Jefferson’s University of Virginia on October 20th, exactly two weeks prior to Election Day. This proposal has been formally presented to the Deeds campaign in a letter from McDonnell Campaign Manager Phil Cox which was sent this morning. In proposing this debate schedule the McDonnell campaign incorporated various invitations received in recent weeks. The campaign has not received a formal debate invitation from any organization in Southwest Virginia, but believes it is important the region play host to a debate as part of this series. Any organization wishing to host a Southwest Virginia debate is encouraged to submit a proposal to the McDonnell and Deeds campaigns. The below proposed debate schedule is a suggestion of dates for this formal series of 10 debates. The McDonnell campaign will work with the Deeds campaign and all debate organizers to ensure that the dates, and locations, for the 10-debate series work for all parties. CNN "State of the Union Virginia Governor’s Debate"
Last night I attended my first meeting of the Loudon County Republican Committee. Probably one of the most significant things that happened at the meeting was hearing from Dave Foster. Throughout the nomination contest Dave Foster told Republican activists that they had three great candidates to choose from, and that he would wholeheartedly support whoever the convention chose as its nominee. Last night he made good on his promise. Dave Foster addressed the LCRC, thanked his supporters, made some of his trademark humor, praised Ken Cuccinelli, and pledged to do anything the Republican ticket wanted him to do. As part of his efforts to elect Ken Cuccinelli, he announced he will be hosting a fundraiser for Ken by the end of July at his D.C. law office. Dave Foster also hinted at a possible future run for office. While I'm not sure what office he would run for (maybe the 8th congressional district?) his bid for attorney general has only improved his chances for future elected office. He improved his statewide name recognition, has supporters across the state, earned the respect of those who did not support him, and did little to get people upset at him through his bid. Dave Foster joked in his speech how Ken referred to him as the "nicest candidate in the race." He was definitely a very nice candidate. He was an honorable candidate to campaign against, and I will be excited to see what he does in the future.